Happy, happy! Joy, joy! 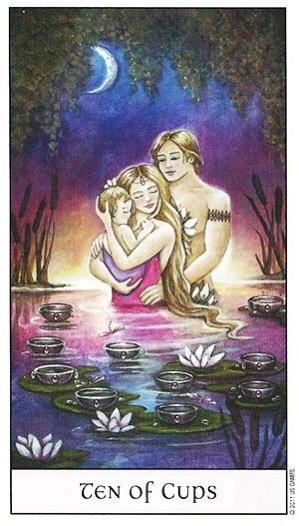 The 10 of Cups is definitely a feelgood card. Today being Saturday, I am inclined to lean toward family time if you are in a position to do so. This is not about the nurturing, or the security, within the home and family, as is the 10 of Pentacles, this is more about the emotional fulfillment and love which can be present within the family and home. This obviously does not apply to everyone, but what does, is your desire this year to modify your goals in order to create the happiness you seek. Everyone has a different perception of what represents happiness in their life. A cycle has been completed and success achieved with a particular project, or situation. This is a positive culmination to your efforts, but, remember, this is only the beginning. The sky is the limit this year. Your success can be as big as your imagination. You only need dare to dream. This entry was posted in Card of the Day, General Tarot, Love and Finance, Patreon, Readings, YouTube Videos and tagged 10 of Cups, Card of the Day, Guidance, Path, Reading, Tarot.